Plexidor Pet Doors: Warm dinner for doggie? 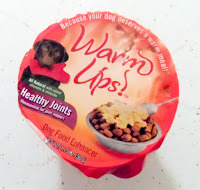 Do dogs want warm food too? WarmUps Pet Food thinks so, and opens up with the question, "Ever notice your dog is the only member of your family not getting a warm meal?" Right there, guilt set in, and I imagined my furbabies munching down the same dry kibble night after night. My dogs are generally rather well behaved. It's true that some furniture have been dog designed and the food bowls have teethmarks, but that's generally from new arrivals, before they settle down. Thus, I didn't think much about the WarmUps container in my tote bag. I put it all on a chair and forgot about it, until I heard a weird noise from the kitchen. Someone made a valiant attempt to get in and taste the WarmUps before they were even done! To make the WarmUps one simply mixes the contents with warm water. Not too warm, around finger warm. The result resembles oatmeal and can be poured over or mixed in with the dog's regular food. Do they work? I honestly haven't tried for long enough to tell, but I do know my dog liked it. Check out the video to see Princess Bonnie try it out. What an interesting idea. I know my dog doesn't care what temperature her food is lol. She'll eat it if it's freezing cold or burning hot unfortunately. I think it is nice, but maybe it could make some dogs picky. Free life jacket for your pet! Pumpkin peanut butter dog cookies! Kittens and puppies make us smarter! How smart is a dog, really?